Innovative Financial Management (IFM) - Blog | Discussion board for financial updates, market pulse and other market research. 1. Management perceived shares in the company to be undervalued in the market place or more generally to support the share price. Company intrinsic value is more than market price. 2. There is no better opportunity to deploy cash, which can generate better returns than cost of capital. 3. Tax efficiency in distributing cash, in market in which the tax rate on cash dividends exceeds the tax rate on capital gains. 4. To absorb increase in share outstanding resulting from the exercise of employee stock options. 5. Capitalization of reserve and surplus to improve ROE. 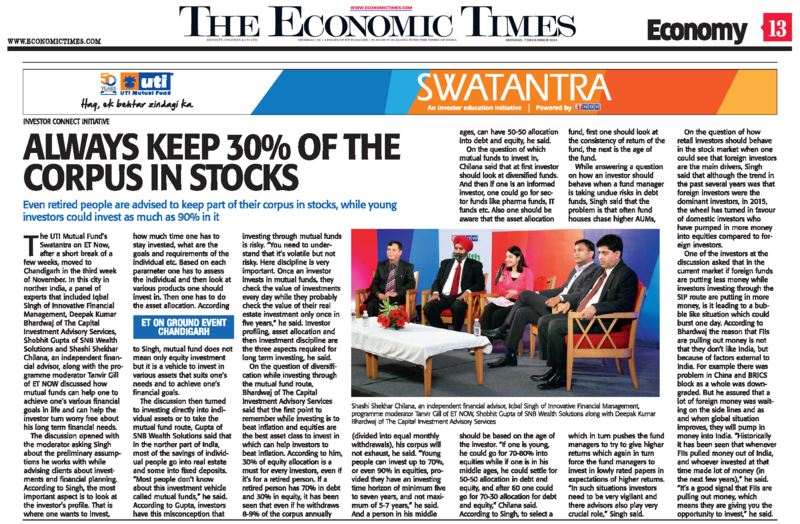 Iqbal Singh, Managing Director of ‪‎IFM‬ along with other panellist featured in today’s ‪‎The Economic Times for investor education initiative- ‪SWATANTRA‬ powered by ‎ET Now‬ and ‎UTI‬. Company has reported marginal rise of 1.19% (Y-o-Y) & huge decline of 29.3% (Q-o-Q) in profit after tax at 12.74 cr. for the quarter ended September 30, 2015 as compared to the quarters ended September 30, 2014 and June 2015. Net Revenues grew by 15.05% on Y-o-Y basis and declined by 17.07% on Q-o-Q basis. Company has posted not good results. On the consolidated basis, for the current quarter ended September 30, 2015 company has reported 41.1% decline & 14.7% rise in net profit and 46% decline & 11.5% rise (ex. Exceptional items) in Profit after tax as compared to for the same quarter in the previous year ended September 30, 2014 and for previous quarter ended June 30, 2015. Net Revenues of the company has decreased by 14.7% on Y-O-y basis and increased marginally by 4.3% on Q-o-Q basis. Company has posted better returns than what was expected. On the consolidated basis, the company has reported 104.4 % & 8% rise in net profit and 157.6% & 4.4% rise in Profit after tax for the quarter ended September 30, 2015 as compared to for the same quarter in the previous year (Q2 FY15) and for the last quarter (Q1 FY16). Net Revenues (consolidated) of the company has increased by 14.1% and marginally decreased by 2.3% for quarter under review as compared to the quarter ended September, 2014 and June, 2015 respectively. These extraordinary results were also due to drastic drop in exceptional expenses. Exceptional expenses are not ordinary expenses and occur rarely and have no impact in future earnings. So we have filtered those effects. Excluding exceptional expenses, Net profit and Profit after tax grew by 63.5% on Y-o-Y basis, which are much better than both industry and its own past performance. On the consolidated basis, Amara Raja Batteries Ltd. has reported 22.20% rise in its net profit after taxes on Y-o-Y basis and minute rise of 0.39% in net profit on Q-o-Q basis. Total income of the company has increased by 9.25% & 1.16% at Rs 1158.29 crore for quarter under review as compared to the quarter ended September 30, 2014 and quarter ended June 2015. Axis Bank Ltd. has reported good financial results in the current quarter. On the consolidated basis, company has reported 18.93% rise and 3.17% decline in net profit compared to same quarter last year & previous quarter respectively. Gross Interest income reported at Rs. 9,960 Cr. Grew by 15.58% and 0.24% for the quarter under review as compared to the quarter ended September, 2014 and June, 2015 respectively. Net interest income at Rs. 4,062 Cr. grew by 15.24% & 0.14% on Y-o-Y basis & Q-o-Q basis and net interest margin stood at 3.85%. Other income (majorly fee income) is 17% of total income. Core operating income (excluding earnings on sale of investments) increased by 19.67% at Rs. 3460 Cr. Asset quality of the bank deteriorated marginally. The bank’s Gross NPA and Net NPA for the July-September quarter of the current fiscal increased to 1.38% and 0.48% as compared to 1.34% and 1.34% in the same quarter of the previous year respectively. Proportion of CASA as on 30-Sep-2015 stood at 44%. Return on assets was 1.64%. The bank has posted a rise of 20.49% & 6.44% in its net profit at Rs 2869.45 crore for the quarter ended September 30, 2015 as compared to the same quarter in the previous year & last quarter resp. Total income has increased by 24.68% at Rs 17324.28 crore for quarter under review as compared to Rs 13894.73 crore for the quarter ended September 30, 2014. Net income saw a rise of 24.69% and other income saw a rise of 24.65% on Y-o-Y basis. Asset quality of the bank has also improved. The bank’s gross NPA for the July-September quarter of the current fiscal improved to 0.91%, as compared to 1.02% in the same quarter of the previous year. Besides, bank’s Net NPA stood at 0.25% in Q2FY16. CASA proportion as on 30-Sep-2015 stands at 40%. Company has declared results as per expectations. On the consolidated basis, HCL Tech. has reported decline in net profit by 2.92% and rise of 2.21% on sequential basis. Net Revenues (consolidated) of the company has increased by 15.59% and 3.27% at Rs 15,635 crore for quarter under review as compared to the quarter ended September, 2014 and June, 2015 respectively. Zee Entertainment Enterprises (ZEE) has reported results for second quarter ended September 30, 2015. On the consolidated basis, the company has reported 8.72% & 1.5% rise in its net profit for the quarter ended September 30, 2015 (Q2, FY16) as compared to the same quarter in the previous year ended September 30, 2014 (Q2, FY15) and previous quarter ended June 30, 2015 (Q1, FY16) respectively. Net Revenues (consolidated) of the company has increased by 23.89% Year-on-Year basis and 3.36% Quarter-on-Quarter basis to Rs 1,384.9 crore for quarter under review.